Hello, and welcome to one of Steven Spielberg’s most obscure films! Due to the director’s immensely high profile, there really can’t be a forgotten Spielberg effort, but some of his movies have largely gotten lost in the shuffle. For instance, relatively few ever saw 1974’s Sugarland Express. However, that flick remains reasonably well-known due to its historical value since it was Spielberg’s first theatrical release. While the movie didn’t sell too many tickets, the cast of 1989’s Always helps save it from obscurity. After all, it stars two Oscar winners in Richard Dreyfuss and Holly Hunter, though the latter wouldn’t obtain her award until a few years later for 1993’s The Piano. It also features John Goodman in a supporting part well before he turned into a star via Roseanne and The Flintstones. As a Spielberg piece, Always seems unusual just because it’s so darned bland. Actually, it stands out in other ways, mainly because it offers the director’s rare foray into the romantic comedy genre. 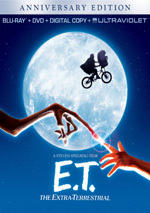 Of course, other Spielberg flicks included romantic elements, and Always features drama and bathos as well as some lighter aspects, but it still seems unusual due to its emphasis. The film focuses on the adventures of pilots who drop water on forest fires. Regarded as the best of the bunch, Pete (Dreyfuss) lives a good life with his best friend and coworker Al (Goodman) as well as his radio controller girlfriend Dorinda (Hunter). However, she worries about him due to the danger involved in the job, and his risky attitude toward the task doesn’t engender fewer worries on her part. As such, Pete agrees to take on a job as a pilot trainer, though he hates to leave the active skies. He does this to show his affection for Dorinda, although he apparently can’t bring himself to actually tell her he loves her. Inevitably, Pete takes on one last job when a major fire roars, and he doesn’t come back alive from this one. Always doesn’t exactly venture into much new ground creatively, though it’s hard for any remake to indulge in fresh territory. Usually, the most a filmmaker can hope to do with this sort of effort is to give it an interesting twist or attitude. I never saw A Guy Named Joe - the film that Always reworks - so it’s impossible for me to judge the success of Always in that department. Nonethelss, I can’t say that much about the film seems particularly inspiring. Really, Always has to be the most nondescript film Spielberg has made. I don’t regard that as a terrible negative, for I’ll take the blandness of Always over the stereotypically Spielbergian sentiment of Amistad and Color Purple, but it feels less like one of his own flicks than the others. The unmemorable side of Always really seems to be its main flaw. At this point, the most significant aspect of the movie is the way that it prefigured the following year’s megahit Ghost. 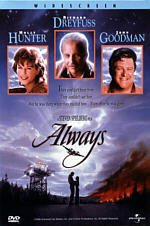 I think it’s very likely that director Jerry Zucker took in a few screenings of Always, as Ghost clearly evokes the Spielberg flick, including the iconic use of an old pop standard. “Smoke Gets In Your Eyes” pops up in Always like “Unchained Melody” works in Ghost. Both also feature leads who can’t tell their women they love them until it’s too late. It seems odd that a rip-off of a Spielberg film handily outperformed the director’s own work, but that’s what happened here. Always struggled to gross a mediocre $43 million, while Ghost snagged a hearty $217 million and became the second top-seller of 1990, behind only super success Home Alone. Whatever the case may be, I won’t bemoan the financial failure of Always, for the movie merits no wails of pain. At best, the film offers a reasonably entertaining and compelling experience, but it remains forgettable and quickly fades from consciousness. The absence of anamorphic enhancement created one of the issues – but not the only one. Still, the movie showed erratic delineation. At best, sharpness appeared passable, but most of the film seemed soft and fuzzy. Prominent edge haloes formed clear distractions and helped rob the image of any potential detail. Sporadic instances of jaggies and moiré effects appeared, and digital artifacts ran rampant. Those elements crawled on screen, and a mix of print flaws like specks, marks and debris offered further distractions. Colors appeared muddy. The movie went with a warm golden-influenced palette but the DVD turned these heavy and too dense. Inky, murky blacks followed suit, and low-light shots seemed dull and too opaque. This was a badly dated old transfer that looked pretty bad. I felt happier with the surprisingly vivid Dolby Digital 4.1 soundtrack of Always. Given the vintage of the movie and its genre, I didn’t expect a very exciting mix, but I was pleasantly surprised by the experience. Only minor extras appear here. In addition to two trailers, we find text Production Notes and Cast & Filmmakers biographies. None of this adds a lot. At best, Always offers a moderately compelling diversion, but it lacks anything to make it more than that. I enjoyed my time with the film, but thoughts of it left me almost instantly and the experience seemed forgettable. The DVD offers pretty good audio but picture seems poor and the set lacks substantial supplements. This becomes a weak release for a mediocre movie.